1.Visit Amazon Offer Page.To Grab Best deals then Download Amazon app by dialling 18002677777. 2.Sign in/Sign up in App. 3.Add desired products in your cart. 4.Checkout and Enter Your shipping details. 5.Pay with COD Or Other Payment Option. Note : Pay With HDFC Cards to get 15% Extra cashback on app.In desktop website amazon is offering 10% extra discount on products. 1.To get more benefit from festive sales you should download amazon app,because it will give you 15% discount on paying amount with HDFC Cards. 2.Amazon is providing a facility "sneak peek" to inform any deals to you before everyone,you have to Nominate yourself for the Promotion by filling in your Amazon.in account details on the "Nomination Page for the Sneak Peek Promotion" and clicking on the "Subscribe".You will get mail of all latest upcoming deals. 3.Festive Sales will live on 13th,October so be ready for this by downloading app,filling shipping details,save card value,fast speed connection same as flipkart we posted before. 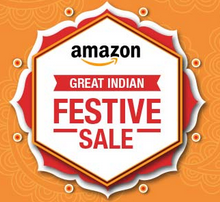 5.Now Wait and Ready For Amazon Festive Sales 2015.